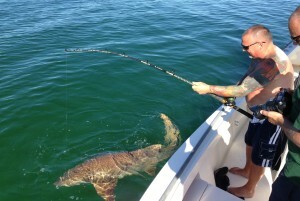 Shark fishing out of Tampa Bay is truly a world class angling experience. Tampa Bay is one of the world’s most populated shark infested waters in the world. Now that shouldn’t scare you beach goers away. Despite our large shark population, we have suffered few shark attacks on our bay area beaches. The truth is we do have numerous sharks, but not many of the dangerous species frequent our crystal clear water beaches. That being said I sure wouldn’t go swimming in some of our deeper passes, because at that point you’re asking for it. Every year during Tarpon season I get to see the vicious power of the largest of Florida sharks. There is nothing like seeing a 15 ft. Hammerhead swallowing a Tarpon while the shark crashes into the side of the boat. Bull Sharks are one of our ferocious sea monsters. I have seen them go vertical all the way out of the water with a 125 pound Tarpon in their mouth. Shark fishing charters are not only exciting because of the size of our sharks, but the diversity of our shark population always leaves the angler wondering what is on the end of their rod. It could be a 4 ft. Black Nose or a monster Hammerhead. Tampa Bay shark charters are available for Hammerhead, Bull, Tiger, Spinner, Black Nose, Blacktip, Lemon, Bonnethead and Nurse Sharks to name the most common. Yes there were some Great White Sharks caught in the area many years ago, although there haven’t been any recent sightings. The White Shark is a coldwater species not seen often in the Gulf of Mexico. Mako sharks are more common and are generally found very far offshore. It’s no accident that Tampa Bay shark fishing is so good. The Tampa Bay area is Florida’s largest saltwater estuary teaming with aquatic life, like many other species of fish it’s a nursery to a variety of different kinds of Florida sharks. Florida shark fishing is a popular angling endeavor across the state. More and more, sharks are being considered to be a trophy catch and a creditable target. 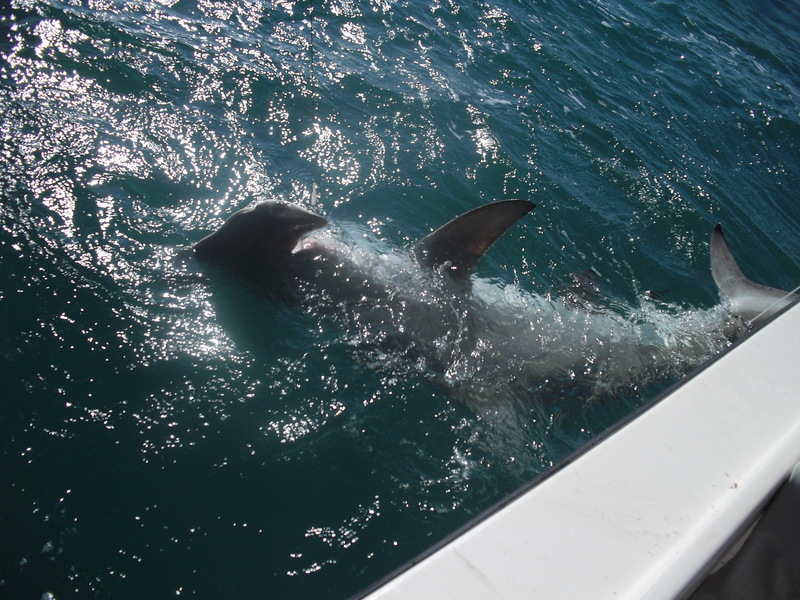 Many species get big and are hard fighters, and visitors to the state plan more shark fishing trips every year. These days there are even some popular shark fishing tournament trails across the state, which of course make a stop in Tampa bay. Captains are often asked how to fish for sharks. My best shark fishing tip is to have plenty of bloody fish for chum and for bait. Sharks can smell blood in the water from miles away and are attracted to it. They use their nose more that any fish that swims. Most of our shark charters range from one to six people in the boat. It is fun for everybody. While some fishermen are manning the shark rods, others can be fishing for different varieties of fish. Many times the sharks are mixed in with our pelagic fish like the Mackerel, False Albacore or Kingfish, all of which make great shark bait. Even when bottom fishing for Grouper, it’s worth leaving out a high, out of the way shark line if someone is looking for a battle. When putting together a shark fishing rig, the most important part is matching your equipment to the size of the fish you are chasing. When on the flats catching 3 ft. Bonnetheads, a 10 pound test light tackle rod with a shrimp does the job. For most circumstances 50 or 60 pound test with heavy 70 pound plus single stand wire suffices. When shark fishing Tampa Bay if you are planning on landing a full grown Tiger, Hammered, or Bull shark, a 150 pound plus line with heavy braided wire and a thick heavy hook is needed to do the job properly. Some off our largest Hammerhead Sharks can reach over 1400 pounds.